If you’re not lucky enough to have long eyelashes naturally, you can try fake eyelash extensions, mascara and curling. These options will achieve the look that you want; however, you will spend a lot of your time taking care of it and it takes some work every day. Men are attracted with women with beautiful eyes. Eyelash extensions make the eyes look nice and even the most resitant men are easily seduced by them. They make women´s eye look wider and more open which gives them a more feminine look. 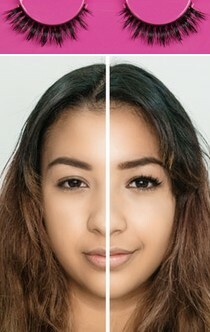 They can also offer women many more options when applying make up. Long eyelashes appear much better in photograhs than regular-short eyelashes. The above are just a few reasons women want to get these long eyelash extensions. But overall, what it really gives them is that great self-esteem, they look good and their confidence is boosted. Eyelash extensions are very customizable. When you are at a salon, you can choose extensions lengths from 9 to 15mm, but it will look perfecty fine on most people at 10-12mm. After selecting the length of of your eyelashes, you can choose what type of curl you will want on them such as a “J” or “C” curl. “C” curls are more dramatic, but if you can do “J” curls on the inner corners of your eyes and “J” curls on the outer parts of your eyes to give it that cat eye look. An Eyelash Curler and Tweezers Set is a beauty essential a woman should always have handy to help eyelashes curls reach that maximum extension and shape at all times. In terms of material, you have a lot to choose from: Faux Mink, Faux Fox, Silk, Real Mink, and last but not least, Real Human Hair. The Bambi Mink Eyelash Extensions for example is one you could get that will surely enhance your eye shapes, feel comfortable and realistic. Its stips allows up to 30 uses, and with a sturdy strip making it easy to control while applying. Even without makeup, you will look amazing as shown on this photo. The benefits of mink extensions are that they are more feathery looking and lighter in general, so they put less pressure on your lashes. Mink lashes also come at a higher cost. You should be able to get a full period of 2-3 weeks before getting your eyelashes redone. This is normal time-frame due to the natural growth of each lash. Nevertheless, your eyelashes might fall out if you keep pocking them, so it is important to keep them intact. If you are unlucky to get a not so professional handling you, it might also fall out sooner. It is also important to stay away from water during the first 12-24 of application, and generally stay away from oily makeup products around your eyes as these can make them fall out sooner than expected. As mentioned earlier, makeup combined with eyelashes will give you that extra look. Liquid-based eye products; however, will be damaging to the eyelash extensions, but you could use a tiny wing of liquid liner so long as you're not dragging it along the eyelash line. When removing the shadow or liner, use oil-free oil-free makeup remover and Q-tips for precision. Most importantly, stay away from mascara entirely as it leaves the extensions crusty and damaged. Eyelash extensions will not destroy your natural lashes. You just have to make sure they are applied and removed properly. You will however damage your natural lashes if you just rub your eyes or pull the extensions. They have to be removed properly so not to damage your natural lashes. Just as you would research a professional hairstylist to take care of your hair or anything else for that matter, especially when it comes to things near your eyes, do yourself a favor, and investigate the salon or technician who will be taking care of your eyelash extensions. Ask for before and after photos if available for the services they provided in the past. Ensure they are licensed for this type of work. If you happen to be around South Africa and would like to visit our salon, please go to our Beauty Salon dedicated webpage for more information on our services.